GENERAL REMARKS ABOUT DISEASES OF THE SKIN. The skin is not only a covering for the body, but also an important organ for the elimination of certain materials from the blood. In this respect the skin ranks with the kidneys, the lungs and the intestines; it is an organ of excretion - that is, its function is to separate and throw off certain materials which are no longer required in the animal economy. The skin, therefore, is liable to derangements of function as a result of constitutional disturbance, just as are the kidneys, the lungs and the bowels ; and in addition, its exposure to the weather and to external influences of various kinds makes it especially often the seat of disease. First. Those that proceed from within the body,- affections of the blood, and of the different organs-which may, therefore, be called internal causes. Second. Those which act from without, and may hence be called external causes. 1. Blood poisoning. This might also be called impurities of the blood ; yet there is an objection to the use of this term because of the popular errors in regard to its significance. For in the popular mind an impurity of the blood means usually that something external to the body has been taken into the blood, and that this impure substance is the cause of a rash upon the skin. By impurities of the blood, however, the physician understands not necessarily that there has been any entrance of poisonous matter into the body, but merely that the different organs - the kidneys, lungs, liver, etc.-do not remove from the blood those materials which have been consumed during the vital processes, and which must therefore be thrown out from the body. Properly speaking, therefore, the blood of every individual is impure whenever he suffers from Bright's disease, or liver complaint, or dyspepsia ; though in these cases there is not usually any rash upon the skin. 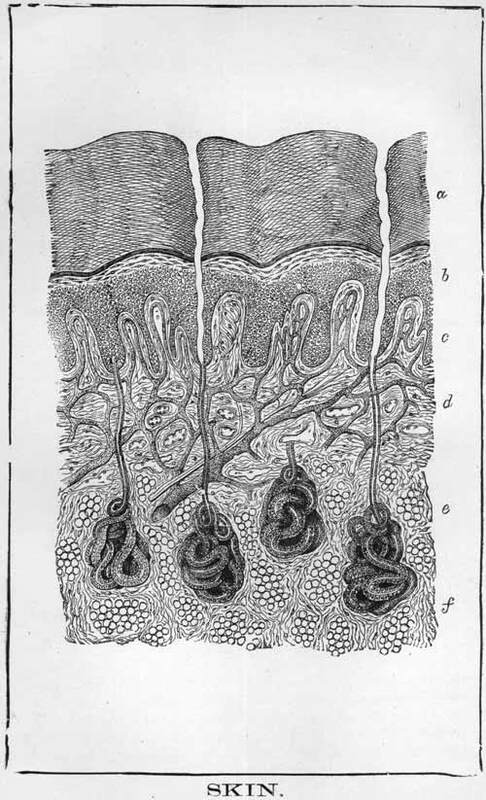 There are, it is true, certain impurities in the blood-such as the contagious principle of syphilis-which, at certain periods of the disease, usually cause a rash upon the skin ; yet, it is equally true, that the individual's blood may be loaded with the impurity of syphilis for years at a time without showing any rash upon the skin. It is evident, therefore, that the prevalent idea as to the connection between a skin disease and " bad blood," is wholly erroneous ; since, in the first place, skin disease often exists in individuals who are otherwise perfectly healthy, and whose blood is in consequence, perfectly pure ; while in the second place, the skin is often free from disease in individuals who are sinks of the foulest corruption. If this fact be appreciated, it becomes apparent that the popular notions about " purifying the blood " are erroneous. Thousands of gallons of " blood purifiers " are sold annually, and used by individuals who imagine that a rash on the skin means that some impurity of the blood is " breaking out" of the body. Such persons are thoroughly well pleased when, after taking a few pint bottles of some patent medicine for purifying the blood, they see pimples appear on the face, chest and back. They regard these pimples as proof that the blood contained some impurity and that the patent medicine has caused this impurity to work out through the " pores of the skin." After using the medicine for a few weeks, until they are satisfied that the impurities are driven out of the system, they stop taking the mixture and the rash disappears. The physiology of this whole matter is so simple and plain, that the individual probably never doubts for a moment that he has really caused some impurities to escape from the system through the skin. The fact is, that these blood purifiers so-called are constructed essentially on the simple principle that certain drugs, when taken into the system, cause a rash of pimples to appear on the skin. It is well known to the general public as well as to the profession, that mercury, when used to excess, causes an excessive flow of saliva and other symptoms constituting the condition known as " saliva­ tion. " It is equally well known to medical men, that the iodide of potassium, or the bromide of potassium, when taken for a long time or in large quantities, causes an eruption of pimples on the face; indeed, if the drug be taken in sufficient quantity, the pimples can be made to appear over the entire skin. The so-called blood purifiers, which are so popular with the public, contain large quantities of one of these or similar drugs ; i-^eir effect is, therefore, to cause a rash to appear upon the skin, which they will do when taken by any person no matter how pure the blood may be. The rash does indeed indicate that there is an impurity in the blood, but this impurity was taken into the blood in the shape of the blood purifier. It should be said once for all, that no rash on the skin is ever a means whereby the body is relieved of impurities ; nor is there any remedy known by which impurities of the blood can be made to escape from the body in the shape of a rash. Closely allied with this superstition, is the idea so prevalent, among women especially, that it is dangerous to " drive in " a rash on the skin. The idea prevails that some poisonous material is seeking to find its way out of the body through the pimples or other eruptions which may be present ; and that to do anything which could remove the rash would drive this supposed poisonous matter back into the body and perhaps cause a fatal result ; the rash, in other words, " strikes in," and does harm. Indeed friends often object strongly to any treatment which could have in view the cure of a skin disease, especially if this disease has lasted for some time ; and if the disease be nevertheless cured, any ailment which may befall the patient in the succeeding months is sure to be ascribed to the " striking in " of the skin disease. This notion, too, is one of the exploded fancies which have been left to us from medieval medicine ; and it may be emphatically stated that no instance is known in which any disease of the skin has " struck in " and done injury. Yet that the presence in the blood of various infectious materials which may perhaps be called " impurities," is abundantly shown by the different eruptive diseases. It is well established that there is a specific virus or poison whereby scarlet fever, for example, is induced ; and it is als'o evident that the effect of this poison is among other things to produce a rash on the skin. Yet there is no reason for believing that the poison is located in the skin ; in fact many cases of scarlet fever occur in which no rash can be distinguished. The different eruptions - scarlet fever, measles, small­pox and the like - are merely due to the derangement in the action of the skin, just as the vomiting of small­pox and scarlet fever is due to the deranged action of the stomach, and as the delirium and convulsions are due to the deranged action of the brain. 2. Hereditary influence is another of the internal causes which are active in the production of skin diseases. Certain eruptions on the skin, such as psoriasis and eczema, appear more frequently in the children of parents who have suffered from these diseases than in others. 3. Nervous disturbance is another of the internal influences which predispose to the formation of rashes on the skin, and at times indeed seem quite responsible for the entire eruption ; thus, excessive emotion has been known to cause the appearance of nettlerash. Among the external causes which induce, or tend to induce diseases of the skin, are those which act directly, such as irritating substances. Familiar examples of these causes are the occurrences of eruptions on the hands of bakers, washerwomen and bricklayers, who are often afflicted with diseases of the skin caused by the contact of the irritating substances which they are compelled to handle. In this class too belongs the itch, which is caused by the mechanical irritation of a microscopic animal ; and it is a familiar observation that certain other small animals, not microscopic, frequently cause eruptions. Various other external influences act indirectly in causing skin eruptions. Among these may be mentioned want of cleanliness and the contact of irritating materials used for clothing. In this connection it should be remarked that the popular idea as to the relation between cleanliness and skin diseases is largely incorrect. Many people believe that the appearance of a rash on the skin indicates a neglect of cleanliness on the part of the individual. There are, it is true, certain rashes which affect limited parts of the skin if cleanliness be neglected ; but these are parts of the skin which are not usually exposed to the public gaze. It may be safely stated that no disease of the face or hands is ever caused by neglect of cleanliness ; furthermore, a want of attention to personal cleanliness is by no means sufficient of itself to cause a rash on the skin. There must be a predisposition of the skin to the formation of the rash, in order that the eruption shall appear, even if the person be filthy. The antiquated belief as to the relations between skin eruptions and " impurities of the blood," accounts also for the fact that a disease of the skin is regarded as far more objectionable and mortifying than a disease of the internal organs. The gout is somewhat aristocratic ; dyspepsia is usually fashionable ; consumption lends a certain air of melancholy interest; Bright's disease enrolls the sufferer among the martyrs; but salt rheum, or any other rash on the skin, is devoid of all such charms, and is the source of mortification to the patient and of disgust to others. Some of the diseases which afflict the skin could be avoided by careful attention to the requirements of the body. This attention includes not only the care of the skin, but also the regulation of the general health. One of the first requisites in the care of the skin itself is of course cleanliness. The scales which compose the outer part of the skin are constantly being thrown off, or at least becoming loosened so that they can be readily removed ; and thousands of glands - the sweat glands, so-called - pour out upon the surface of the skin a considerable amount of watery liquid ; this perspiration takes place all the time, by night and by day, in winter as well as in summer, though varying of course in quantity. In addition to these glands there are also numerous little pockets in the skin, called sebaceous glands, which secrete and throw out upon the skin an oily material. The result is that there is constantly accumulating on the surface of the skin a quantity of material made up of the dried scales composing the outer part of the skin, and of the liquids which are discharged upon its surface ; these materials must be removed in order to. permit the free action of the various glands ; since otherwise the openings of these glands-the " pores " of the skin - become stopped up, and the result of this stoppage may be an inflammation. For the removal of this material there is required as a general rule only soap and water. As to the selection of soap there are certain popular impressions which are not altogether correct. There are several requisites for a good soap : first the fat from which it is made must be sweet, that is not rancid, for no matter what the other excellencies of the article may be, the presence of rancid fat in it is very apt to cause roughness and itching of the skin, which may even proceed to eczema or " salt rheum. " The second requisite is that the soap shall not contain too much potash or other alkali. The alkali or "lye" in the soap is intended first to combine with the fat used in making the soap, and second to combine with the fatty matters on the skin so as to facilitate their removal by the water. An excess of potash makes the soap extremely irritating, and may readily provoke diseased action in the skin ; we are all familiar with the irritating effects of even short contact with ' soft soft," which differs from the hard soap chiefly in the large amount of lye which it contains. The third requisite is that the soap shall contain no substances capable of inducing disease of the skin. This may seem an entirely unnecessary remark, but experience shows that the commoner varieties of soap frequently contain refuse matters from the animals from which the fat used in making the the soap was procured. A fourth essential for a good soap is that it should contain no other ingredients than the fat and the alkali. Many soaps are intentionally adulterated with various foreign matters, especially varieties of clay ; and numerous others are colored green, red, etc., and are scented with questionable perfumes. We are familiar with the fact that the dyes used in coloring candies, wall paper, stockings, etc., are often productive of disease in those using them ; and we may readily appreciate the fact, which has been established by experience, that the coloring matters used in tinting soaps are frequently as injurious as the dyes used in coloring stockings. The perfumes, also, are usually of the cheaper sort, many of them manufactured from petroleum ; these may retain the irritating properties of the substance from which they are made. It has become quite popular in recent years to use so-called " medicated " soaps, which are supposed not only to keep the skin in excellent condition, but also to guard and protect it against the numerous diseases to which it is liable. Thus we are flooded with innumerable varieties of sulphur soaps, tar soaps, glycerine soaps, carbolic acid soaps, etc., without mentioning the numerous articles supposed to contain honey, lettuce, celery, etc. Of all these, it may be said their use is advantageous only to the manufacturer and the dealer. It is evident, upon the slightest consideration, that even if these soaps were impregnated with materials which could benefit the skin, no particular advantage would be derived from such brief contact as is ordinarily given to a soap. But the fact is, first, that these soaps do not contain enough of a remedial agent to accomplish any good; and, second, that most of the substances employed for this purpose possess no curative value for skin diseases ; indeed, some of them are decidedly injurious to the skin, and serve by constant irritation to provoke an inflammation. Furthermore, the healthy skin requires no other care than simple cleanliness. If this be secured, and if it be protected from contact with irritating substances, the skin remains healthy, unless there be some impairment of the general health. It may be, therefore, in general stated, that the so-called medicated soaps are in no case better than a good unmedicated soap, and are often times worse, because positively injurious. It may be said that physicians often prescribe medicated soaps in private practice in the treatment of skin diseases. This is undoubtedly true. There are several so-called soaps which are made for the purpose and are not intended to cleanse the skin, but merely to serve as a convenient means for applying remedies to the skin. It is also true that physicians often prescribe some variety of tar soap, but this is done in some cases merely to be certain that the patient employs no injurious article, and in other cases largely for its moral effect. People in general are far too much addicted to taking medicine. A patient is apt to feel that he does not get his money's worth upon consulting a physician, unless some medicine is prescribed. Hence it sometimes becomes necessary to order bread pills and colored water just for the patient's satisfaction, and in the same way it is often the part of discretion to order tar soap in the treatment of skin diseases. But it must be remembered that diseases of the skin vary much in their nature, and therefore in the treatment adapted to them. Hence a remedy which may be useful in one is quite out of place, and even injurious, in another. This fact alone demonstrates that the use of any soap as a panacea for all diseases of the skin is of necessity an absurdity. Physicians themselves derive much benefit from this promiscuous use of medicated soaps, since these articles are responsible for many cases of eczema, and of some other skin diseases. It would be out of place in this work to specify by name any particular brands of soap which can be recommended; it will suffice to say that white castile soap, when properly made, is one of the most satisfactoiy. This is made of soda and olive oil, and is free from all injurious constituents. Among certain classes, the idea prevails that while soap should be used on other parts of the body, it should be carefully kept from the face. This, of course, is a mistaken impression ; the skin of the face does not differ in any essential particular from that of the rest of the body, and there is no reason why it should not be cleansed as thoroughly as the remainder of the skin. In fact, it seems probable that certain rashes which are limited to the face are sometimes caused by the neglect to use soap upon the face, and the consequent accumulation of materials which should be removed. As to the water best adapted for cleansing purposes, it is generally understpod that the purest water is the best; in other words, that the so-called " soft water,"-that is, that which does not contain salts in solution is most advantageous. As to the temperature it may be said in general that the patient should be guided by his own sensations, both during and after the application of the water to the skin. CONTENTS OF DISEASES OF THE SKIN. -Salt Rheum - Eczema: cause, treatment. -Barbers' Itch - Sycosis: treatment. -Hair Dyes: numerous receipts for restoring the hair. -Nettle Rash - Urticaria: treatment. -Fish-skin Disease - Icthyosis : treatment. -Barbadoes Leg - Elephantiasis: treatment. -DIET IN DISEASES OF THE SKIN. Above is a picture of the parts of human skin.